East meets West with Scion Japandi. 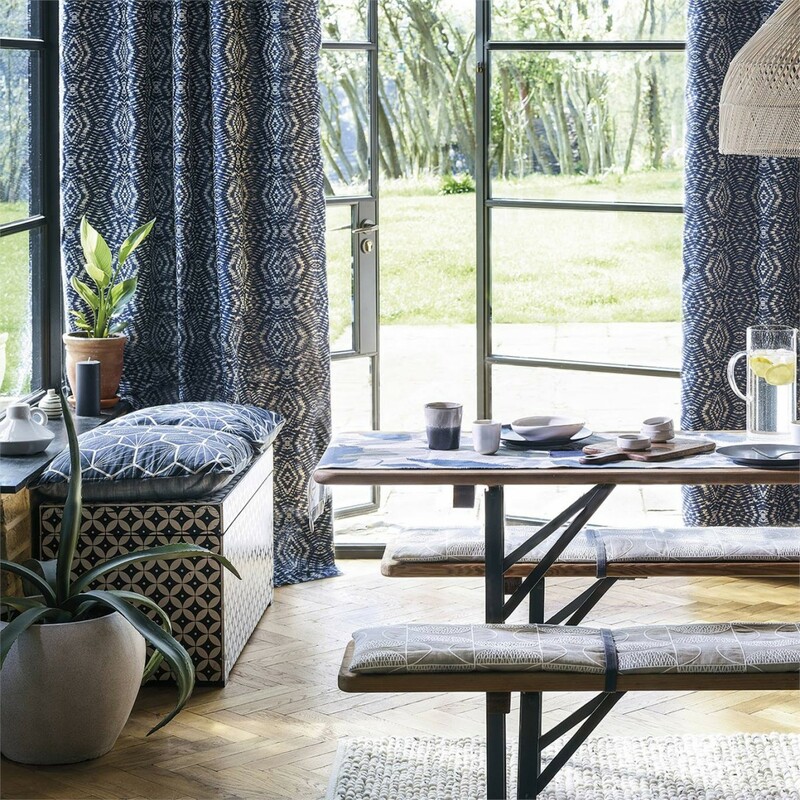 This beautiful new collection of curtain fabrics and wallpapers from Scion taking its style and history from Japan and blending it with a simplistic Scandinavian twist, making it a perfect collection for homemakers, mixing traditional with a modern edge. Comprising of 27 fabrics for use with our in-house curtains & roman blind manufacturing we have, and 32 wallpapers with many of them coordinating with each other. The inspiration for the Akira design (Akira meaning ‘sunlight from the moon’) has been taken from the print of an archive kimono, depicting elegant floral trails with a gorgeous brushed edge that adds a feel of the ‘imperfectly perfect’ to this striking print. (Kimono now has come to mean traditional clothing and first emerged in the Heian period in Japan, which lasted from 794 to 1192). This design is perfect for making into curtains or roman blinds, where you can see the stunning effect it creates when made into curtains in the below photography. 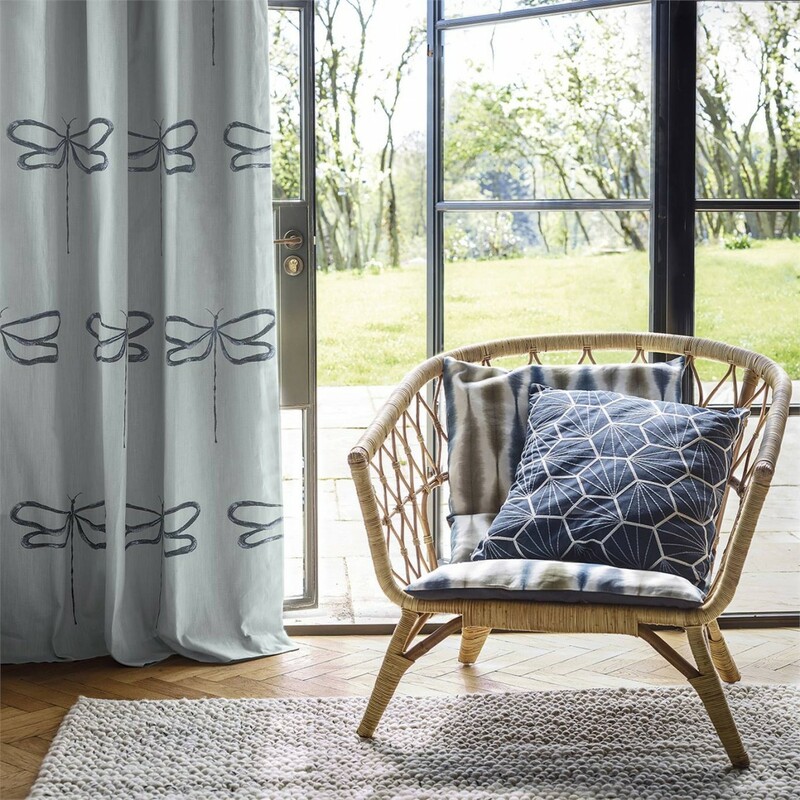 The Dragonfly design which is beautifully elegant providing a dramatic statement design of a painterly dragonfly with a simple sketched body and fragile wings. The dragonfly is symbolic around the world with the mental and emotional maturity and the understanding of the deeper meaning of life. Perfect for changing the look and style of your room, as this fabric also has a matching/coordinating wallpaper. Then we also have the Usuko design with its traditional Japanese name and ikat design, just perfect for making a statement. What’s not to love about this fabric? The Aikyo (meaning forest) design combines the Scandi geometric elements and style with a hand-crafted Japanese look by adding texture and colour to any room. This fabric also has matching/coordinating wallpaper. The chunky texture and four different colour options of the Uteki design make it a true ikat design with softer muted colours making it one of my favourites. It also has matching/coordinating wallpapers, meaning that you could mix and match the colours of the walls with curtains to create an individual look. We love the timeless look of the Shinku design, (Shinku is of Japanese origin and means “Pure Ruby”). It’s a beautifully embroidered geometric design, available in 5 lovely colours that you could never tire of. This design also has matching/coordinating wallpapers to add to your room. Kazue (meaning “harmony, peace”) is a jacquard design which has such a lovely sheen and drape. This striking fabric is available in three lovely colourways: Ink, Pewter and Spice. Looking for ways to improve and update your home? Come and visit our Coventry showroom, where our experienced staff will be more than happy to discuss your needs and help you find just what you were looking for. 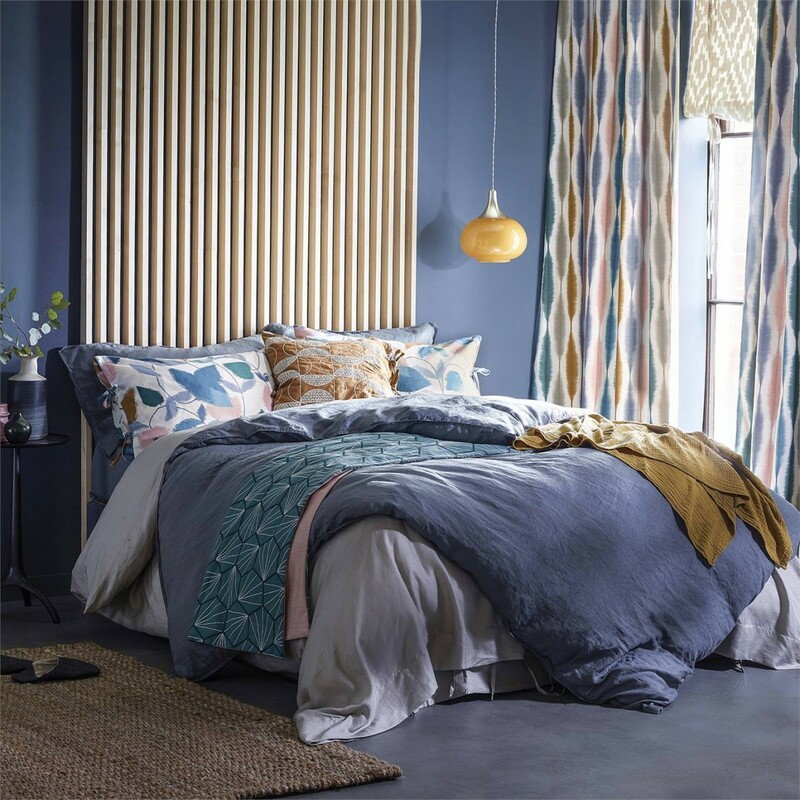 You may be surprised at the thousands of beautiful curtain fabrics and wallpapers from the leading designer brands that we have in our Coventry showroom. Below is our window display which currently depicts this new Scion Japandi collection, so come and take a look for yourself at how beautiful it really is. We now have Cole & Son’s new Icon collection available to buy in our showroom. 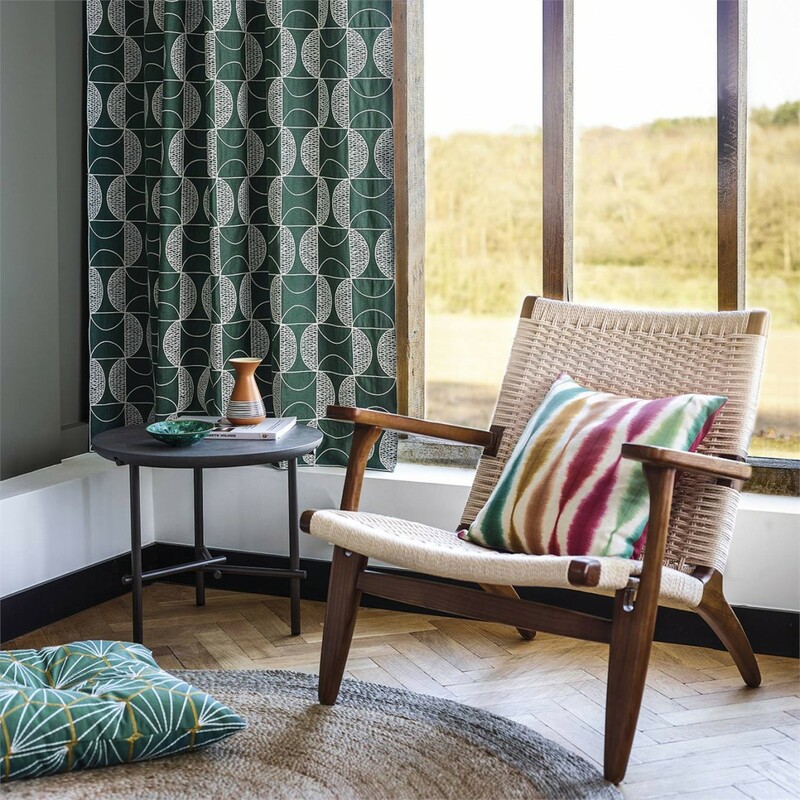 Introducing Icons by Cole & Son – a contemporary selection of wallpapers which revisits some of Cole & Son’s most iconic, best-selling designs. Some of the relaunched favourites include Woods, Hummingbirds and Palm Leaves all of which have been featured in a refreshingly glamorous, 1950s Miami inspired colour palette. Each design has been reproduced in a new combination of contemporary colourways such as bright, vivid hues and tropical, sun-bleached shades reflecting a 1950s South Beach bold style. The original Palm Jungle print has been relaunched in both bold and toned down colourways, whilst still retaining the same details which made the original print so popular. Colourways: Seafoam, Petrol & Lime, Forest Green, Stone & Taupe. A more simplistic version of the Palm Jungle design, Palm Leaves has had a pastel colour makeover. Each colourway reflects a retro Miami cool effect adding a soft, neutral base with a couple of vivid colourways to make way for an unforgettable interior. Colourways: Alabaster & Pink, Mint & Sand, Viridian, Ink & Violet. Inspired by Michael Clark’s 1959 screen print, Cole & Son’s Woods wallpaper design is a firm favourite with its timeless, cosy feel. For this collection, Woods has had a refined update using uncomplicated tones such as Linens, Whites and Greys. Colourways: Linen & Charcoal, Stone & White, Parchment, Grey & White, Old Olive. The elegant and loved Hummingbirds wallpaper has had an enchanting update with 4 new contrasting and enduring colourways. Colourways: Viridian, Green & Pink, Pastel, Charcoal & Ginger. Appearing in softer shades and a bold, exciting shade of Charcoal and Bronze, the Faceted Tile design is a geometric wallpaper inspired by the North African courtyards of Morocco. Colourways: Powder Blue, Soft Grey, Duck Egg, Parchment, Charcoal & Bronze. This exuberant Miami inspired design pays homage to the epicentre of tropical, retro style. Featuring layers of luscious tropical vegetation and terraced balcony’s this design is now available in a chalky, kitsch colourway and a more bold statement colourway. Colourways: Pastel, Soot & Snow. The iconic geometric Prism design as been reinvented in a muted pastel colourway to create an elegant yet striking feature wallpaper. A silhouette stem design with an etched background, the iconic Cow Parsley adds a pastoral ambience to any interior. Now available in colourways that are more calming with a classic feel. Colourways: Charcoal, Parchment, Ballet Slipper, Olive, Viridian. A beautiful textured flock featuring a large-scale paisley design conveying a delicate grandeur with its pale flocking and eye-catching colourways. Colourways: Yellow & White, Hyacinth & White. An inviting design inspired by the geometric pattern from a feather fan. Available in soft, pastel colourways and a striking colourway which adds depth to the delicate design. Colourways: Charcoal & Bronze, Taupe, Ballet Slipper, Seafoam, Old Olive. Still one of Cole & Son’s most popular designs, Flamingos is a charming design featuring nonchalant birds and subtle background foliage. Colourways: Olive, Ballet Slipper, Lilac Grey, Ink & Alabaster Pink. Visit our showroom to discover more Cole & Son collections. We now have Sanderson’s new Chiswick Grove Wallpapers, Fabrics and Linden Weaves available to buy in our showroom. Sanderson’s Chiswick Grove fabric & wallpaper collections celebrate the golden era of 1879 when Arthur Sanderson set up his first wallpaper factory in Chiswick, a leafy hamlet of London situated on the River Thames. The collections comprise timeless and refined country styles with an understated elegance. Sanderson have carefully crafted the designs by using a variety of techniques including printing new artwork from the original pear wood blocks to truly bring the patterns to life. Available in 9 timeless designs. Available in 11 designs varying prints, weaves and embroideries. Linden Weaves is a small scale geometric fabric available in 20 beautifully elegant colourways. All of which work in harmony with the Chiswick Grove wallpaper and fabric collections, alongside the rest of the Sanderson range. We now have Harlequin’s new Entity Wallpapers, Fabrics and Quadric Weaves available to buy in our showroom. Harlequin’s new Entity collection is an urban modernist collection inspired by ‘Architectural Fashion’. The collection transforms natural silhouettes by exploring the interplay of light and shadow with the repetition and organisation of pattern. Entity is a geometric range of wallpapers and fabrics with exaggerated outlines, engineered layers and an emphasis on shape and form, resulting in a polished industrial aesthetic with a soft edge. Entity wallpapers comprises nine designs exploring different effects such as 3D, metallic versus matt, triangles against squares, concrete effects and an eye catching digitally printed panel. Entity fabrics comprises nine designs inspired by the reflections of shiny glass panels, broken shards, layered spheres, angular geo-florals, chevrons and silhouettes of people in a crowded city. A variety of techniques and textures have been used across these striking designs, including metallic accents, lustrous velvets and high-shine weaves for added glamour. Comprising four easy-to-use upholstery fabrics including a statement triangular motif and a luxurious woven plain, these fabrics beautifully complement the Entity collection. Putting the effort into decorating your child’s bedroom is important, as it’s where they will grow, play and dream for most of their childhood years. Choosing a wallpaper for your child’s bedroom, playroom or nursery can be a difficult process as children’s interests can change very quickly. Will you focus on a specific character or theme? Or go for bold, fun and colourful prints that will see them through many, many years? We’ve put together 10 of our most popular children’s wallpapers to guide you through the process of choosing the right wallpaper for your child’s bedroom. Your little ones will love their new bedroom with these bright and colourful wallpapers that will help them to explore and learn. And don’t forget, you’ve got to live with it too so it’s definitely worth taking your time whilst making your decision! ‘Animal Magic’ by Scion is loved by girls and boys alike. The wallpaper comprises of an abundance of labelled zoo animals of all shapes and sizes. Your child will be able to discover zoo animals and their names with this wallpaper, as the friendly characters keep them company throughout their younger years. Available in 2 bright colourways. ‘What a Hoot’ by Harlequin features quirky little owls perched on branches, accompanied by their woodland companions. Available in 3 mixed colourways this wallpaper is the perfect solution for a variety of children’s bedroom styles. ‘Two by Two’ by Sanderson is a vintage design available in 4 pastel colourways. The vintage design depicts the story of Noah’s Ark with the animals situated in pairs as they board the ark. ‘Lilleby’ by Boråstapeter is a fun and cheeky design. This wallpaper features little birds, cherries, butterflies and birdhouses situated in a woodland garden setting. An imaginative and playful design with a mature twist that your children won’t grow out of too quickly. Available in 3 charming colourways. ‘Reggie Robot’ by Harlequin is bright, colourful and full of character. Reggie is a computer-styled character which combines pops of colour with loads of fun and imagination. Available in 3 bold colourways. ‘Whale of a Time’ by Scion is an ocean lovers dream wallpaper. Featuring lots of friendly whales, this wallpaper will bring waves of fun into any room. ‘Treasure Map’ by Sanderson is full of new discoveries. The more you look at this wallpaper, the more you start to discover. You and your children will never get bored of this world map design with whimsical detailing of the native flora and fauna of the different continents. Send your children aboard the pirate ship to adventure across the world to discover hidden treasures. Available in 3 subtle colourways. ‘Felicity Flamingo’ by Scion is a fabulous wallpaper ideal for a girl’s bedroom. Felicity is sure to add style to any girls bedroom with her love for all things fabulous and fancy. Available in 2 pretty colourways. ‘Little Fox’ by Scion is a small-scale version of the original showstopper; Mr Fox. Little Fox is Mr Fox’s fantastic little brother, and he’s here to cause mischief amongst children’s bedrooms. Available in 5 intriguing colourways. ‘Fairy Castle’ by Sanderson is perfect for a fairy tale princess’s room. This dreamy wallpaper features small fairies, pretty flowers and castles conjuring up a magical fairy world. Available in 3 desirable colourways. Don’t forget to visit our large showroom to see more of our beautifully vast range of product samples and displays, and to speak to our experienced showroom staff. Did this post inspire you? We really do love to see your interiors, so why not share your creations with us on our social media? 2017 has seen us say goodbye to the more subtle, pastel shades in interior decor and say hello to the more luscious jewel tones and textures. Jewel tones and textures can make your interior sparkle and give it that added touch of elegance and glamour. Vibrant colours such as sapphire blue, emerald green, daring pink and royal purple will be taking the centre stage in interiors. From the furniture and wall decor to soft furnishings and accessories. This means we’re seeing more variation in the use of materials that have been inspired by metals, space and the cosmos. Floaty silks, transparent sheers and sumptuous velvets will be making an appearance on furniture and window dressings alongside vibrant wall decor and accessories. Using silks & sheers in your interior really adds a touch of royalty and elegance. Silks drape well and add an attractiveness to the room with shiny highlights, whereas sheers are light and add a spacious feel to a room. The good thing with silks is the colour intensity of them which enables you to really achieve rich hues in your room – perfect for jewel tones! Accent wallpapers and fabrics can create a main focus for a room, giving you something to work off of and extract colours from that can be used in your accessories and furniture. Incorporate a statement accent pattern that’s vibrant and full of contrasting jewel tones to really lift your decor and inject some personality into the room. Soft, sumptuous and full of richness, velvets will transform your room into a luxurious setting. Velvets can be incorporated into your furniture such as sofas and footstools, or they can be used for curtains to create a lavish warming feel. Metallic Hues perfectly compliment jewel tones with a cosy yet deluxe feel. You can get a metallic hue by using shiny silk fabrics, metallic or glass bead wallpapers or by accessorising with metallic framed mirrors and metal detailing around the room. Also don’t forget to visit our large showroom to see more of our beautifully vast range of product samples and displays, and to speak to our experienced showroom staff. We now have Sanderson HOME’s new Potting Room Wallpapers, Prints & Embroideries and Weaves available to buy in our showroom. A beautiful collection of wallpapers homegrown in the Sanderson Studio, The Potting Room wallpapers celebrate the British love of kitchen gardens and rustic allotments with a charming, hand-crafted feel. The Potting Room wallpaper collection offers eleven refreshing wallpaper designs which have all been inspired by country farmer’s markets, natural wildflower gardens and the humble garden shed. Comprising of a mixture of standard and wide-width wallpapers, this collection is perfect for an easy to use decorating scheme. Harmoniously coordinating prints & embroideries hand-drawn or created with hand-printed techniques in a delightful Potting Shed colour palette. Using rich tones of Brick, Barley and Fig with layers of calming Dove and Duck Egg shades printed on elegantly light cottons and linens to create a peaceful and relaxed country feel. Comprising of six designs, Sanderson’s Potting Room Weaves have been designed in a subtle colour palette which easily co-ordinates with the wallpapers and prints & embroideries. 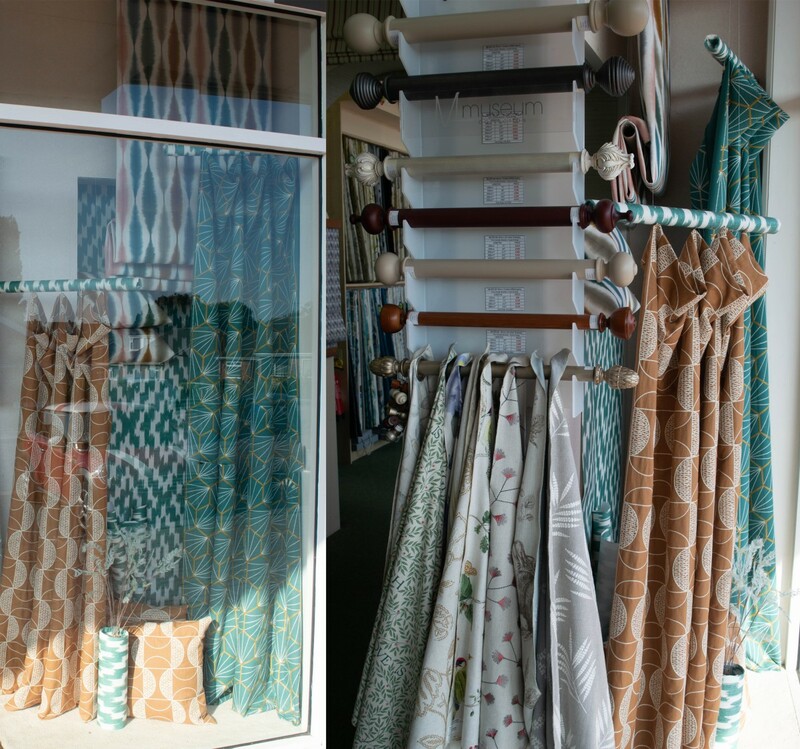 We now have Prestigious Textile’s ‘Beachcomber’, ‘Cotswolds’ and ‘Magical’ fabric collections available in our showroom. 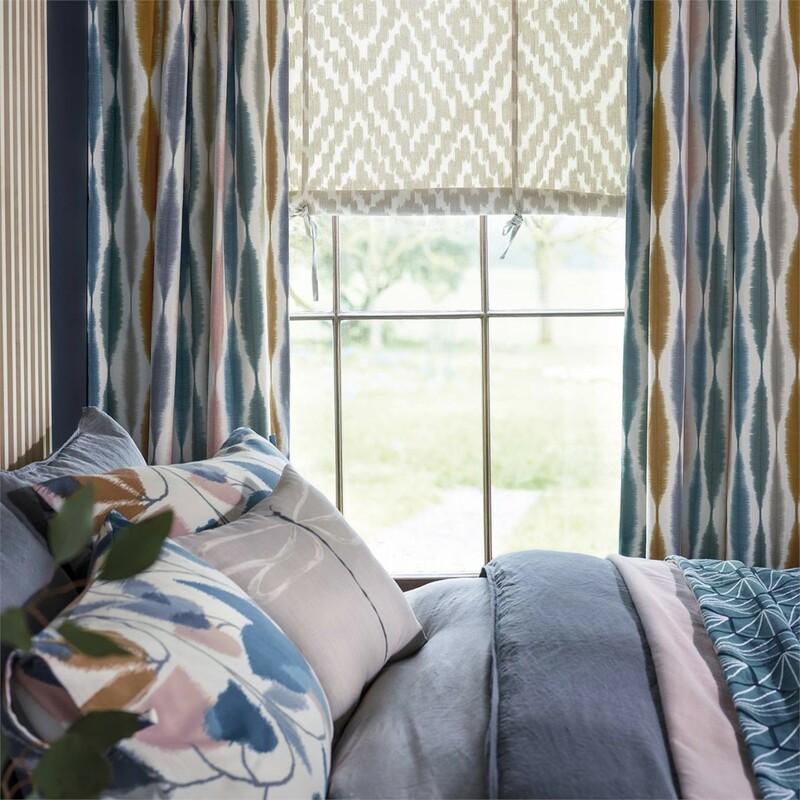 Inspired by sunny walks along the beach, Beachcomber fabrics comprises a medley of maritime themes including birds, sea life, boats and seaside scenes. The designs are of a hand-drawn sketch style available in a selection of warm colourways printed on 100% cotton. 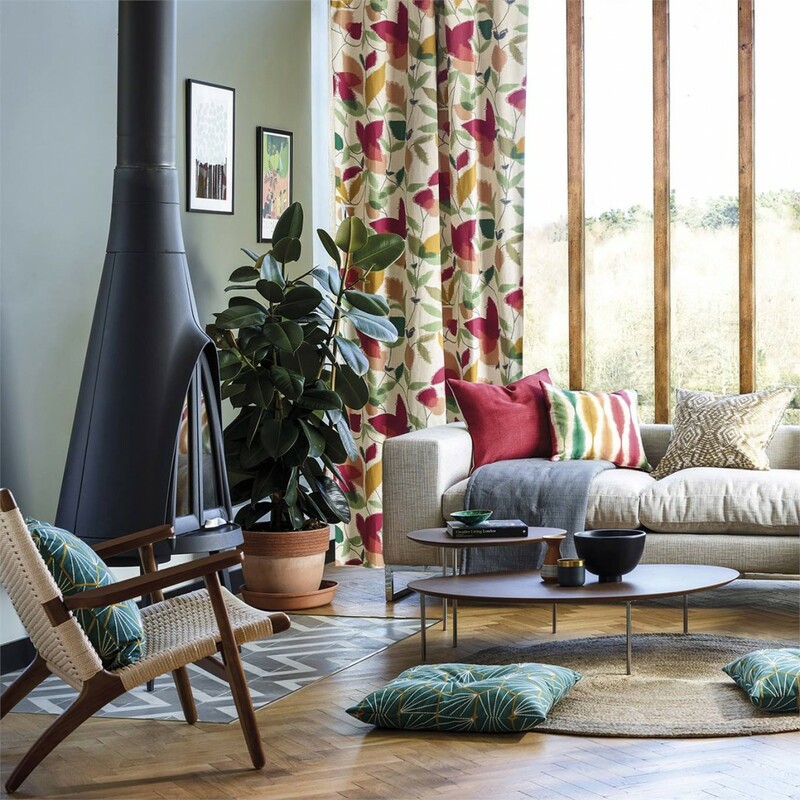 The cotswolds fabric collection is a contemporary take on traditional country living featuring embroidered leaf motifs, ombré twill stripes and rustic weaves supported by soft plains for matching upholstery. This collection really is magical! Each fabric is produced to give off a random cross-hatched effect with a metallic shine. These poly cotton plains are simply entrancing and perfect for curtains, cushions and accessories. 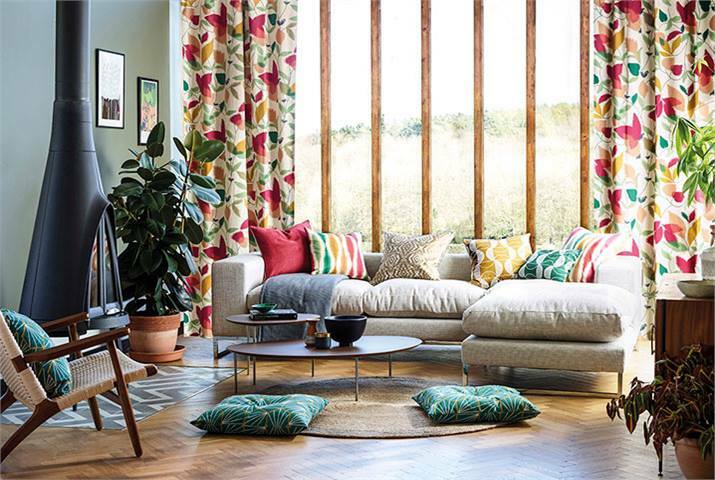 We now have Harlequin’s ‘Lilaea’ & Lilaea Silks’ fabric collections available in our showroom. Clarissa Hulse has outdone herself once again with her new ‘Lilaea’ collection in collaboration with Harlequin. A vibrant and glamorous range of fabrics which displays Clarissa’s well known style of contemporary botanical designs with intense colourways. These fabrics are perfect for creating a statement in your home. Lilaea Silks beautifully compliments the Lilaea fabric range with it’s collection of 100% silks in a rich & luscious colour palette. The sun is shining, the flowers have bloomed, the air is fresh and the birds are tweeting – spring has finally sprung upon us with a refreshing breeze and it looks like it’s here to stay. It’s time to say goodbye to the winter blues and say hello to spring blooms with flourishing florals, sunshine yellows and gentle greens this season. As the seasons change it is important that your interior changes slightly too, you don’t have to go mad and completely renovate don’t worry! Just simple changes in curtains, wall paint/wallpaper or accessories can really uplift and give a refresh to your interior through the change of seasons. The fields are starting to come alive with pops of colour from spring flowers such as tulips, daffodils, harebells and violets. Flowers bring so much beauty and joy to interiors with their delicate petals and intricate detailing that can be portrayed beautifully in various forms of design. ‘Flower Power’ brings together a selection of products that capture the harmonious mood of pretty spring florals. Bringing the outside in, in the wilderness pulls together natural woods and neutral tones of lilacs, greens and beiges. Alongside designs which portray the British woodland throughout the spring season such as large ferns and woodland wildlife, creating a relaxing interior that you won’t want to leave. Brighten your interior with shades of yellow this spring to keep the sun shining throughout your home all season. ‘Mellow Yellows’ mixes subtle shades of yellow with light greys to create a relaxing atmosphere that resembles a country interior. The two colours used together in perfect balance can create a laid back, cosy space that feels light and spacious. Don’t forget to share your photos with us on our social media if you’ve used some of the above products – we really do love to see your wonderful interior creations! Also don’t forget to visit our large showroom to see our beautifully vast range of product samples and displays, and to speak to our experienced showroom staff.